The brainchild of two Ita lian artists who set original soundtracks to a montage of black and white films, Remix the Cinema is an immersive experience combing live music performance and cinema screening. Italian Cultural Centre Wales and Snowcat Cinema are delighted to host this unique event at Penarth Pier Pavilion promoting international artistic engagement and innovation in Cardiff and the Vale. Before the screening there is an open workshop with the artists, offering hands-on experience of creative sound and image editing. 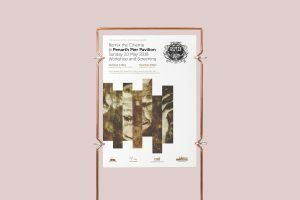 Penarth-based artists Parry & Glynn will facilitate conversations and live drawing in and around the event. Alberto Casati and Luca Acito are part of Action 30, a collective of artists, musicians, thinkers and activists who draw inspiration from the cultural ferment of 1930s Europe. Workshop: 6.00pm. Admission free on the door. We are delighted to announce the Italian duo, Remix the Cinema, will be visiting Swansea for their first UK event on their tour of Europe. 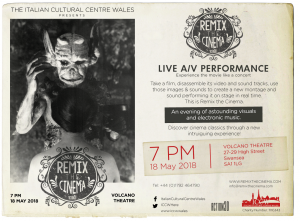 Taking place on Friday 18 May, 7pm @ Volcano Theatre in Swansea, Remix the Cinema is the brainchild of two Italian artists, who set original soundtracks to a montage of classic black and white films. Remix the Cinema is a fully-immersive experience, combining both live music performance and a cinema screening. Please help us spread the word`among friends, supporters and aficionados!